The award-winning Shangri-La Hotel, Dubai, is considered among the finest properties in the Middle East. 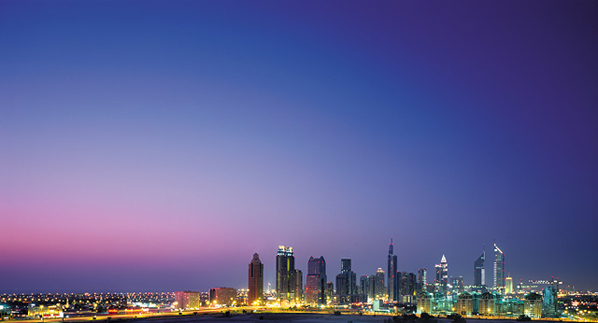 Located along Sheikh Zayed road and standing at an impressive 200 metres, the 42 storey tower is 15 minutes from Dubai International Airport and five minutes from the World Trade Centre, Dubai International Financial Centre and downtown Burj Khalifa. It offers 302 rooms and suites as well as 126 serviced apartments, with the rooms featuring modern conveniences such as satellite colour TV, dataport Internet access, full-sized writing desk, IDD telephone, mini-bar, tea/coffee making facilities as well as bathroom with built-in bathtub and separate shower. Guests staying at the exclusive Horizon Club enjoy privileges and superb facilities including express check in/out, Horizon Club Lounge with complimentary all day refreshments, private health club and indoor infinity pool. For the ultimate experience, guests are invited to try Al-Shams, the Shangri-La presidential suite facing the spectacular view of Burj Khalifa. Feel the elegancy of the ultimate space with the warm décor and the round stairs. The presidential suite is fully equipped from the sound system, to Jacuzzi where L’occitane designer bath amenities, rainforest showers and deep soaking baths will refresh even the weariest of travellers. 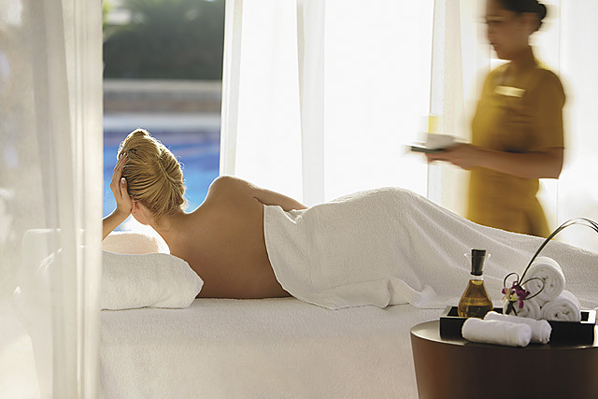 Indulge in a memorable experience that will last a lifetime. Be a star and reach the sky with an ultimate hospitality from the heart. Enjoy the privilege of spatial elegance; awesome views and thoughtfully selected furnishings create an experience of unparalleled style and comfort. 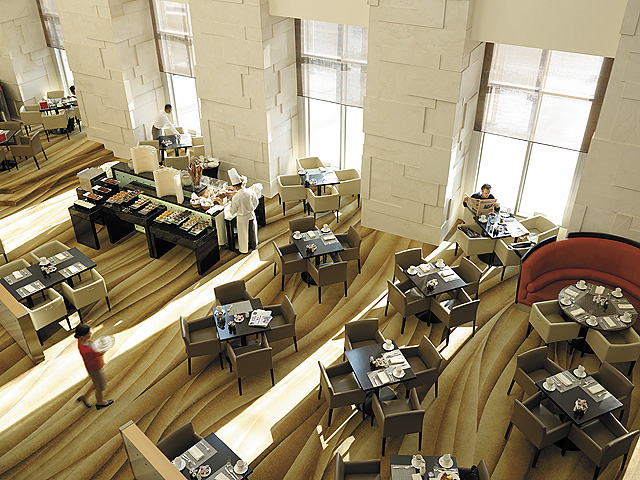 Located on the ground floor, adjacent to the lobby, Dunes Café is an ideal venue for casual dining with friends or business associates at any time of the day. The cooking theatre, featuring different culinary styles, is a showcase for the best of international cuisine and a stage for the chefs’ engaging performances. Experience tastes from Asia with noodles, dim sum, sushi and sashimi prepared at your request. Enjoy mezze and a variety of salads before sampling main courses including superb daily roasts, grilled fish, meat cuts and pizzas from the wood fired oven. Conclude with an extensive selection of international and Arabic desserts. Set in the beautiful surroundings of a traditional Moroccan courtyard garden, and located on the second floor, Marrakech transports you to another world to experience the essence and flavours of the Middle East. With an emphasis on Moroccan cuisine, Marrakech offers authentic tagines, as well as aromas from Levantine cuisine. Amwaj, meaning Waves, is a seafood city bistro that offers guests outstanding fresh seafood and fish dishes prepared in an easy to eat way. Chef Marcello prepares daily specials and set menus, along with pairing wines from the cellar. For a unique dining experience that transports you to a bustling and exciting part of Asia, visit Hoi An. Enjoy authentic Vietnamese cuisine in an intimate ambiance of pale tangerine walls and turquoise green shutters. Under the open rafters and ceiling fans, glorious fresh delicacies come to life every night. From the royal city of Hue to the bustling cities of Hanoi, discover a unique culinary experience in a refreshing environment with the freshest ingredients from different regions of Vietnam. Try the signature spring rolls or crispy lobster ravioli for subtle yet flavorful spices. For a truly authentic Cantonese experience, visit Shangri-La’s signature restaurant ShangPalace, located on level two. ShangPalace offers an extensive and unique Cantonese menu and also features speciality dishes including Peking Duck. The restaurant also serves a Dim Sum special menu and offers special set menus throughout the year. The grand 43-storey Shangri-La Hotel, Dubai is the perfect choice for large functions and smaller intimate gatherings alike. All meeting rooms and ballrooms are contemporary in design and feature natural light and state-of-the-art audio-visual equipment. 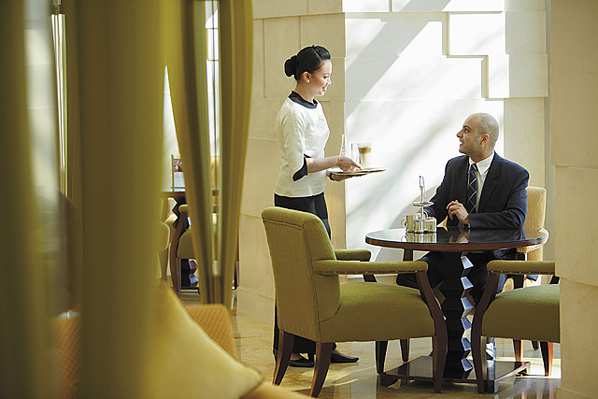 A dedicated and experienced events management team ensures that functions run smoothly from start to finish. The Al Nojoom Grand Ballroom and Al Bader Junior Ballroom offer stunning views of bustling Dubai and the Arabian Gulf. The grand ballroom, which is divisible into two smaller rooms and the junior ballroom can accommodate up to 500 persons for a reception. The three additional function rooms (Nasreen, Yasmin and Arjawan), are ideal breakout rooms or venues for smaller events. Sumptuous banquets prepared by the hotel’s culinary team, comprising staff from all over the world guarantee a memorable dining experience whether for a grand wedding feast at the ballroom or an intimate family affair in one of the function rooms. Whether for rest and relaxation or sports and recreation, Shangri-La Hotel, Dubai has the facilities and services for total guest satisfaction. The entire fourth floor of the hotel is dedicated to The Health Club & Spa at the Shangri-La which embraces a holistic approach to vitality, fitness and beauty and is inspired by traditional Arabic and Asian wellness regiments. Surrender to the intuitive touch of our therapists and natural restorative powers of fragrant oils, aromatic herbs and spices. Relax and rejuvenate in the tranquil waters of our resort-style swimming pool, sauna and steam rooms or challenge yourself to a workout in our state-of-the-art gymnasium, movement studio, squash or tennis courts. The gym is equipped with the latest “Techno-Gym” physical fitness equipment including an impressive range of cardiovascular circuit training apparatus and free weights, while the movement studio offers a variety of exercise classes. Based in Hong Kong, Shangri-La Hotels & Resorts is one of the world’s most respected hotel companies, owning and operating over 70 hotels worldwide under the brands Shangri-La, Kerry(five-star) and Traders (four-star), which translates to more than 30,000 rooms. Shangri-La properties are primarily five-star deluxe city centre and resort hotels with the majority of the city centre hotels having over 500 guestrooms, whereas the resort properties tend to be smaller. New Shangri-La Hotels are scheduled to open in Mumbai, Doha, Chongqing, Toronto, Yangzhou and Istanbul. Next year, the brand will welcome new properties in Bangalore, Mongolia, Tianjin, and Lhasa among others.